The exciting atmosphere not only attracts visitors from far, but also attracts many people in the area to attend. In the morning of March 17th, in the framework of the flower festival of 2018 organized by Dien Bien province, there were activities of displaying, introducing and promoting tourist products and folk games, creating the atmosphere. Fresh and vibrant, attracting crowds of people and visitors. At the 7/5 Square in Dien Bien Phu city, there are sports and folk games exchange activities...creating opportunities for artists and relatives of ethnic groups in and outside the province to meet, cultural exchange. The exciting atmosphere not only attracts visitors from far, but also attracts many people in the area to attend. Miss. Lo Thi Mai, a resident of Dien Bien Phu City, Dien Bien Province, said: "Thai people in Dien Bien do not miss this Bauhinia Flower Festival. Every year we attend the festival. I would also like to see Dien Bien Province growing and attracting more visitors. Miss. Nguyen Minh Giang, a visitor from Bac Giang, said: "When I first came to Dien Bien to celebrate the occasion, I felt very happy, the people here were friendly and friendly. This is very special, rich, folk games are great. If there is a chance I will come back again. In addition, there are 75 booths displaying, introducing and promoting cultural products and special tourism in the localities of Dien Bien province. 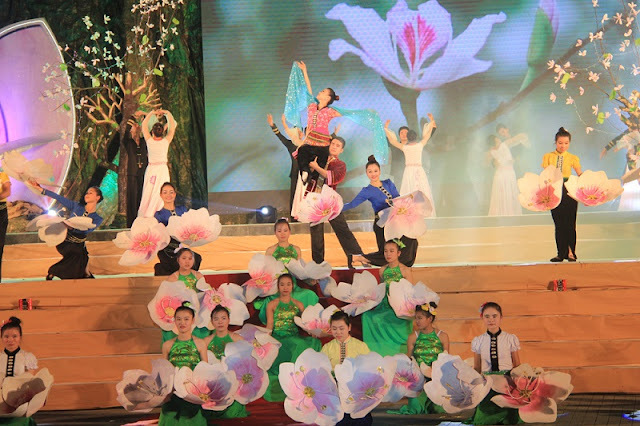 This year's exhibition also attracted 12 units outside the province, introducing the unique culture and tourism of each region, thus creating opportunities for expanding tourism links between Dien Bien and other provinces in the country.